I offer bespoke engagement photography packages – why not have a professional pre-wedding shoot to get into the mood for your wedding? Engagement Photography – How does it work? We can meet at any location of your choice be it central London or Brighton Pier. We’ll have two hours (often more than that and I’m totally not fuzzy about time) to walk around and shoot you two in many different situations and poses. Just walk along a busy High Street or range the woods, hold hands, look at each other from time to time, tell a joke, give a cuddle and a kiss – I’ll shoot everything so we will have hundreds of shots to choose from. Want that impressive sun-glow shot? Then we need to wait for Golden Hour which is just before sunset. Let me teach you some simple posing – nothing complicated, just a few easy steps to make you look gorgeous but still natural. Back in my studio I will select about 30 photos and retouch every single one individually. Two or three days after your session I will send you a link to an online gallery with your shots. There you can download each single picture or all at once with a single click. Why would we need photos of us before the wedding? Simple answer: it’s fun! Engagement photography is one of those luxuries that you don’t really need and yet it’s fun to do and it’s wonderful to have professional pictures of you two when you just got engaged. Just treat yourself to something amazing. Use your photos for your invitations or save-the-date cards. We can make your wedding date part of the picture (written on a board or with a stick in the sand) – let’s be creative! Announce your engagement with a professional picture instead of a selfie. Gain confidence in front of the lens. Learn some simple but effective posing which will make your wedding photoshoot so much easier. Love your pets? Let them be part of it. 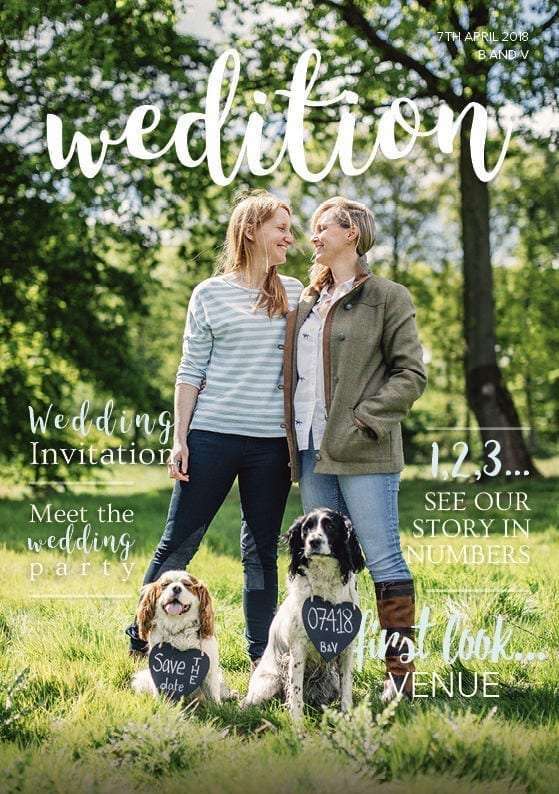 How about your dog holding a sign with your wedding date? These are just a few ideas but the real boundaries are only your imagination. Give me a call and let’s discuss ideas. 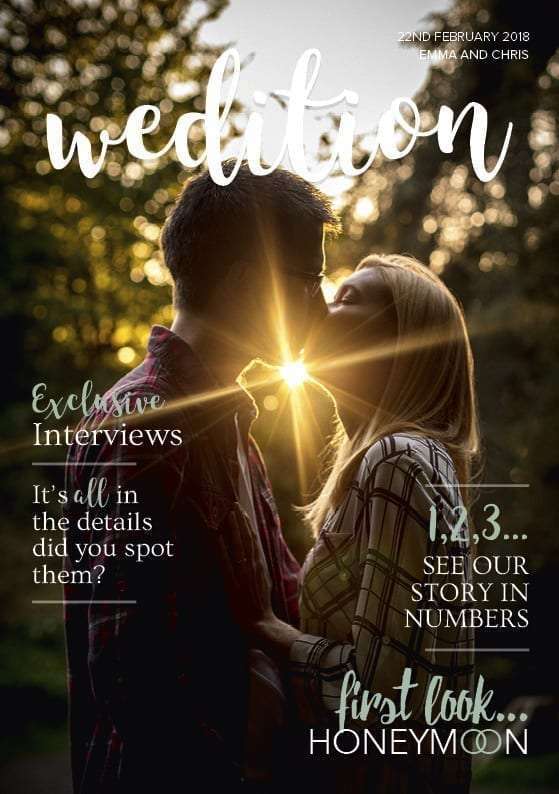 The perfect match – engagement photography and your own personal wedding magazine! Looking for something unusual? 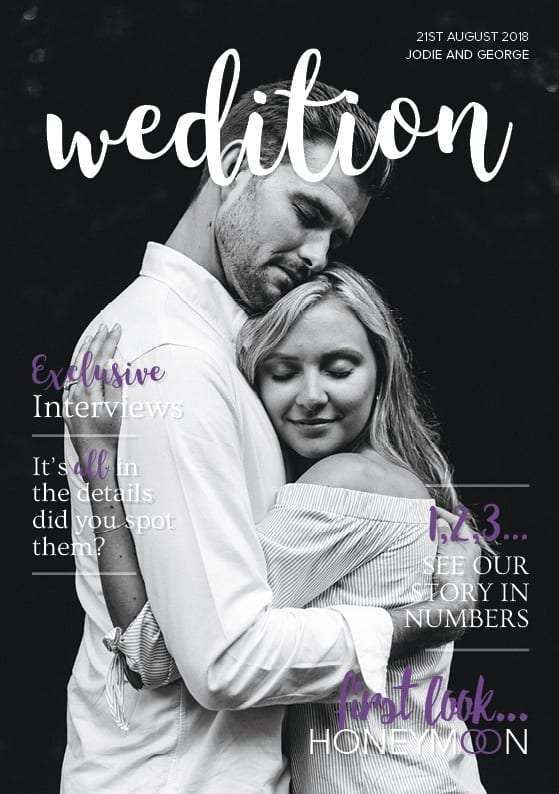 WEDITION offers fantastic bespoke wedding magazines to surprise your guests with during dinner. Professionally designed, high-gloss print, featuring the stories of you and your guests to create a unique memory for everyone to take home. And of course the best part is the cover: an engagement photo of you two. I charge £250 incl. VAT, travel expenses (within M25 and Surrey) and unlimited usage rights (no watermarks, you are free to post, print and share as much as you like). Interested in engagement photography? Please get in touch here.